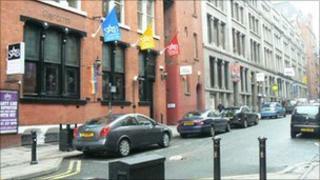 Stanley Street in Liverpool is at the centre of plans to promote the city's gay quarter as an international attraction. A council-funded £12,000 consultation is under way to get views on how the area can be marketed to compete with other cities' successful gay districts. The council said that at "a time of austerity" the quarter could become a "key economic driver". The area caters for the lesbian, gay, bi-sexual and trans-gender communities. Councillor Nick Small, cabinet member for employment and skills, said: "The area around Stanley Street has developed over time to be the city's gay quarter, although there are many businesses there which cater for all communities. "We want Liverpool to be known as an inclusive city. "We have made strides in this in recent years and are being seen as a more gay-friendly city than was the case a few years ago. The success of the Pride festival last year was evidence of that. "We now need to look at how we can develop and promote the quarter. "At a time of austerity, that presents a real challenge - but if we can have a quarter which is inclusive, dynamic and welcoming it can be a key economic driver for the city centre."